This remarkable chilli started life as a caramel 7 primo and well and truly has its home in Western Australia. A talented grower in W.A. inadvertently grew a yellow one from this stock and it was evident right away that it was extremely special. 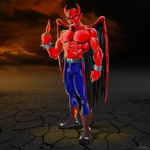 After a couple of generations, it was introduced to Mathew Price, one of Australia’s best chilli scoffers! It is well known in Australia that Mathew can tackle any chilli but this one brought the Aussie Chilli God to his knees. From here on in known as the “God Stopper!” These seeds are from the source and a fairly stable now but yet to be tested for SHU. Try them, we guarantee fun times! This ones hotter than is usual in a habanero variety but tastes sensational. We got this from the chilli grower extraordinaire Alice Lennard. One of the few mustard varieties we’ve grown that turn full mustard colour on bush before going soft. ie. A lot of mustard types go soft before fully turning Mustard colour. We don’t know a great deal about this one but it grows like a typical hab and the pods are hab size. Glad we grew this one and highly recommend for flavour. 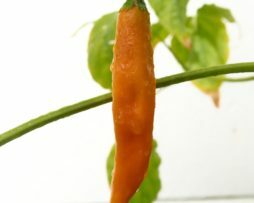 The Afghani pepper is an interesting rare chilli pepper from Afghanistan. It has a dry, tough, bitter and sharp taste when eaten raw however it makes a fantastic dried powder as it has a very strong hot acidic taste which may not be found in other chillis. Although not recommended for any use other than powders, flakes, or rubs it is one we love to use dried. This is one of the most prolific of the space chillies and grows red. Up to 40 fruit on the plant at once and it just keeps pumping them out. Very similar to a cayenne look and taste wise but quite a bit sweeter. 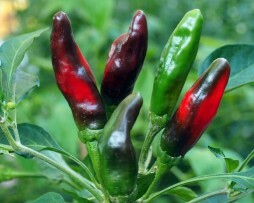 Like the cayenne chilli pepper this one is very versatile but we love them fresh or pickled. 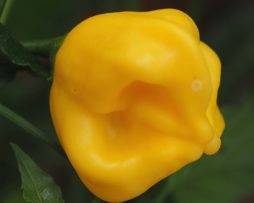 What a flavour sensation this one is…The Aji Amarillo pepper is literally named “yellow chilli pepper” and is grown extensively in Peru. The fruit have a thick skin and grow to approximately 15cms long and 2cms wide. Not too hot as chillies go this one balances heat with an awesome fruity flavour reminiscent of mango and passion-fruit. You have to taste it to believe it. This one makes a great paste but is terrific in sweet curries. The Aji Armarillo is also super easy to grow and pumps out lots and lots of fruit over its long growing season. The Aji Cachucha, otherwise known as Aji Dulce is well known in the Puerto Rico area and also Cuba. 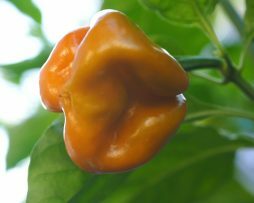 This sweet tasting, spicy chilli is very aromatic and tastes like a habanero with virtually no heat at all. They can be picked at any time from green through to red and make a great pickle relish for sandwiches. It’s a little hard to find this one but it is becoming very popular! 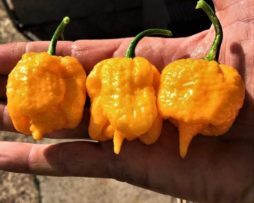 Not much is known about this rare chilli except that it is quite a rare one from Peru. It ripens up from white through to red and sometimes you will get some stunning purple striations as it does. Pod size is on average 2-3cms and they have a slightly sweet and salty flavour. 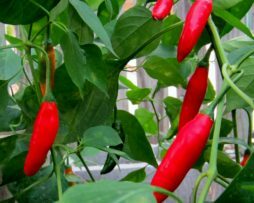 If you love chillies that display a multitude of colours then this is a great one to grow – almost could be classed as an ornamental but tastier. This is said to be the hottest baccatum around measuring up to 100,000 SHU. 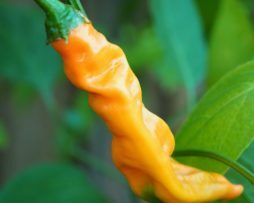 This chilli pepper plant is an awesome producer of 5cm long and 1cm wide chillies – bright yellow almost orange in colour. 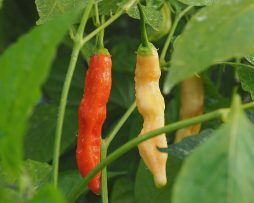 This Peruvian chilli pepper has a slightly sweet citrus flavour that is great fresh or dried. It smells very intriguing almost like a MANGO! We grew this one expecting the usual red variety but it has consistently thrown out amazing fluorescent orange pods – we love it. It is fast growing, fairly compact and a very prolific chilli pepper. 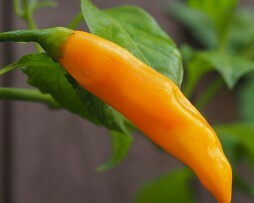 The original Aji Colorado, from which this is a variant, is native to Bolivia and Peru. Packed with flavour these sweet-spicy, thin-walled chillies are extremely versatile. We love this pepper made into a powder as it really brings out the best of its flavour profile. The Aji Crystal chilli is a lovely Baccatum from Curico in Chile. The pods are pendant shaped and grow to about 8cms long. 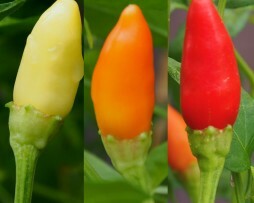 The chilli pods mature from light green, through pale yellow and then to red. They have a wonderful citrus flavour that we love cut up on pizza or to use in a salsa. Usually grow just under a meter high and are quite prolific. 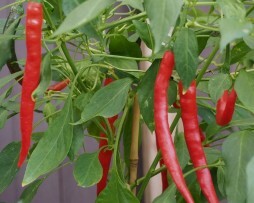 The very versatile Aji Duke chilli was bred in the USA at Duke University. A very prolific small plant that will do well in a patio pot. It is crisp, sweet and a little fruity. Perfect for stir fry, salads and everyday use. It bears fruit nearly all year round in warmer areas. Well worth growing! This pretty little star drop shaped chilli is said to have originated in Finland. 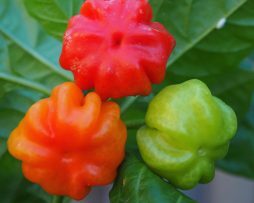 This chilli pepper has a slight fruity sweet taste and gentle heat. Said to have been developed by Fatalii Gourmet. The pods are yellow, medium sized and bell shaped.